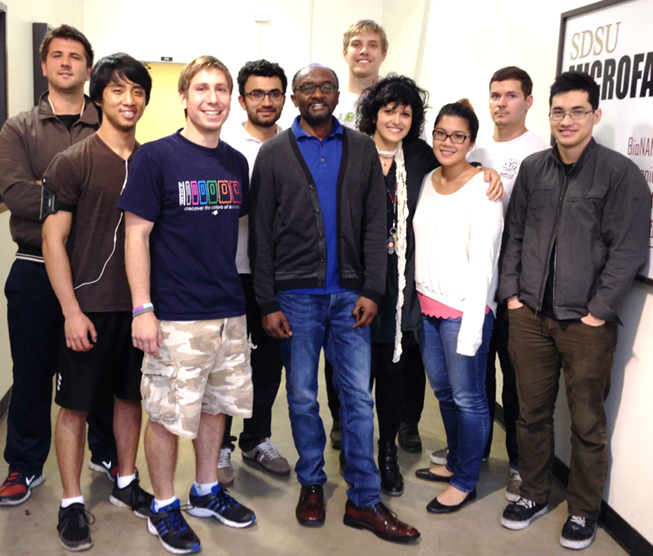 We are part of CSNE – Center for Sensorimotor Neural Engineering – NSF Funded Engineering Research Center (ERC). Together with our collaborators at UW, MIT, and University of Ferrara (Italy), we are working on flexible microelectrode neural pad that can be implanted in the brain to record data and/or stimulate specific sites. The function of the microelectrode neural pad is to sense signals from the motor cortex and then relay those signals to a small integrated circuit (IC) located on the back side electrodes. The IC then wirelessly communicates with a prosthetic or robotic limb in a closed loop manner. We have recently demonstrated a carbon-based array of high aspect-ratio microelectrodes on a flexible substrate for applications in neural sensing and simulations. 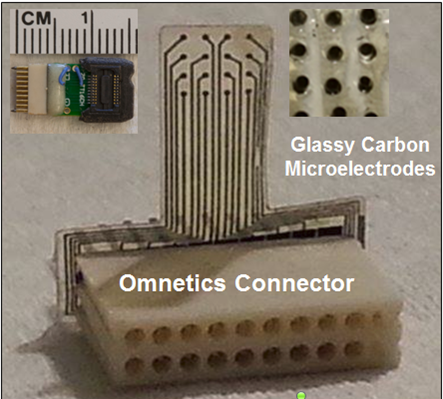 The microelectrodes are made of pyrlozyed carbon derived from polymer pre-cursor using C-MEMS (Carbon MEMS) process and are capable of interrogating a wider area. The ensuing ‘microelectrode array fabric‘ could be used for both implantable as well as wearable applications. The other key potential application includes a microelectrode system as part of tactile sensor in a prosthetic socket. 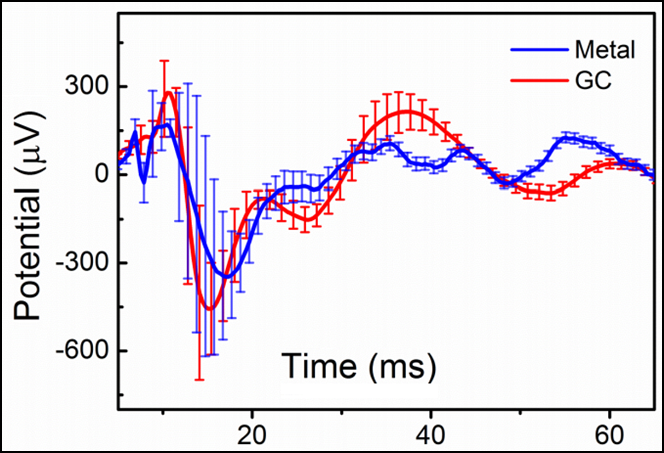 The 3-dimensional aspect of the electrodes offer a significantly higher area of interaction with nerve cells as compared to traditional 2D metal electrodes resulting in higher signal-to-noise ratio. 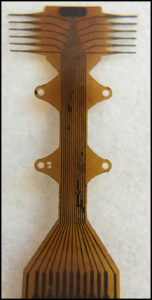 Our electrical characterizations have shown that the polymer-derived graphitic electrode arrays have better electrical signal/noise ratio than traditional 2-dimensional thin-film electrodes. On the other hand, due to their wide electrochemical window in ionic solution as well as reduced tendency to bio-foul, polymer-derived graphitic electrodes have recently caught the attention of researchers for in vivo electrochemical detection of biological species. 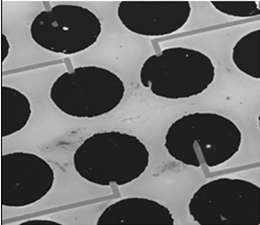 In particular, microfabricated microelectrode arrays could offer a fast and reliable simultaneous, decoupled detection of neurotransmitters like dopamine and serotonin. In this research, we report on investigation of our high aspect-ratio microelectrodes on a flexible substrate for applications in in-vivo electrochemical sensing of neurotransmitters sensing. 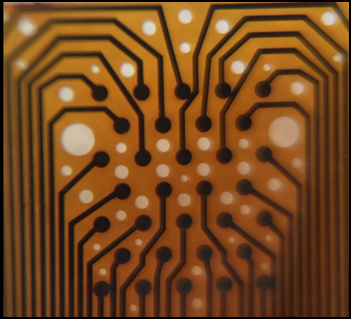 The multi-site microelectrode array will have separate electrodes for sensing electrical and electrochemical signals – but all integrated on a single chip. This simultaneous sensing of ECoG electrical signals as well as electrochemical detection of neurotransmitters like dopamine and serotonin could find powerful use in DBS (deep brain stimulation) where the effect of application of electrical input (voltage) on the response of neurons could be monitored real-time. The array nature of the electrodes will also provide a key advantage of simultaneous and de-coupled detection of several neurotransmitters. Mieko Hirabayashi, Maria Vomero, Pieter van Niekerk, Scott Seidman, Sebastien Nguyen, Roberto Gavuglio, Vivian Nguyen, Jesus Rodriguez. Chet Moritz (UW), Bill Shain (UW), Steve Perlmutter (UW-Physiology and Biophyics), Jacques C. Rudell (UW-ECE), Joel Voldman (MIT), and Luciano Fadiga & Davide Ricci (University of Ferrara).